I’m only just beginning the story of Moses. 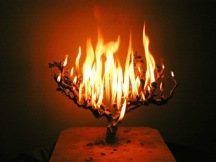 I slowly read of his encounter with a burning bush and the voice of I Am and shoes removed on sacred ground. It has caused me to really evaluate how I approach God. I am quick to watch the show when God is doing something amazing. But, I have to question how casually I sometimes approach Him. We live in a culture that takes God lightly. We want to pick and choose when He gets to be God in our lives. Prayer is often nothing more than idol gossip or a chance to list all of our woes and regrets. We accept His helpfulness, but ignore His holiness. Do I treat God like a remarkable sight? When was the last time I approached Him with face hidden and sandals removed? 1.) That I’m forced to “face” my flesh straight on. My flesh is lazy and would rather not live in this world because of how challenging it is to the believer. Being a Christ-follower means continuous diligence in resisting the devil and seeking Christ. This is a struggle for me. Not that I “desire” to be sinful, but rather, that I get “tired” of having to work so hard to not be sinful. 2.) My first point is like a diagnosis of what is “sick” in my heart – that I don’t entirely trust Jesus to be my strength, my power and the righteous Hand that lifts me up and carries me when I am weak. Thank you so much, Ladies. I really appreciate your visits and feedback. Have a great rest of the week!